My quest to live plastic-free and the lessons I learn along the way. 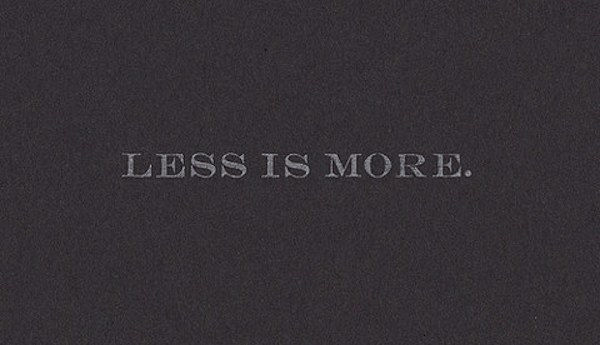 Well tomorrow is finally the day… The Less Is More Festival is back! A celebration of anti-consumerism!!! 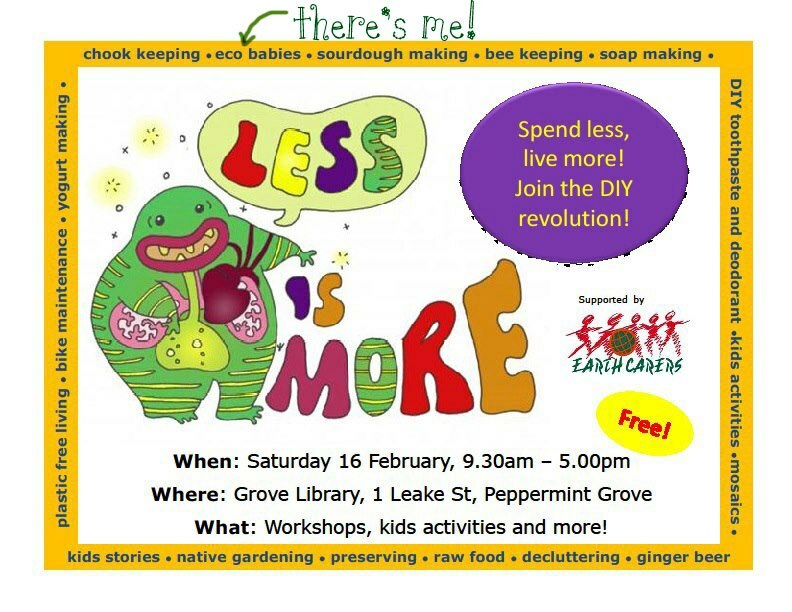 It is an incredible day run by the Western Earth Carers which involves hands on DIY workshops that will show you how to buy less and live better! It is family friendly and of course in the spirit of anti-consumerism… is completely free. View the schedule here of the entire day here. 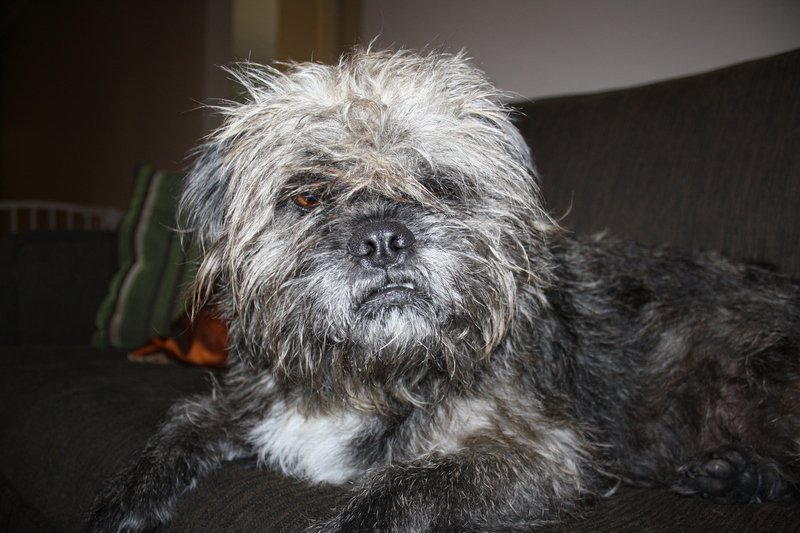 Olive’s Guide to Greening Your Cleaning! 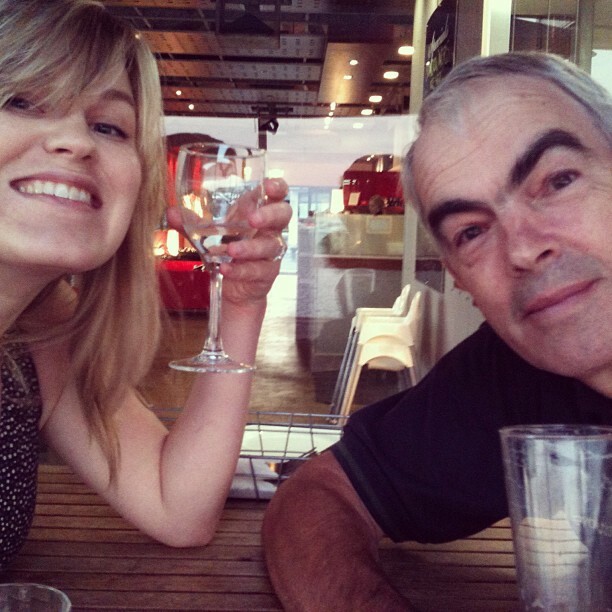 My Dad is wonderful and quirky and funny and one of my absolute best friends in the world and we can quite happily while away many hours chatting, mucking about or just generally pottering. However there is one department where our rivalry is fierce and unyielding (until recently anyway)… Cleaning. Me and my Farsher enjoying a beverage! A bit of background information to set the scene: my Dad is an absolute clean freak – he enjoys it and he is bloody good at it. He has a daughter (hello!) whose school reports always had two words in common – ‘bubbly’ and more to the point… ‘messy’. His nickname for her has always been Stinkbug. But it seems that this little Stinkbug has grown wings because she has developed her own little range of DIY cleaning products so effective that even my Papa Bear has endorsed them. And best bit? They are all much better for the health of the environment and your house than your standard bleach and fragrance laden concoctions. If they can pass Dad’s test then they must be good so I wanted to share them with you all and explain how I go about my eco cleaning. 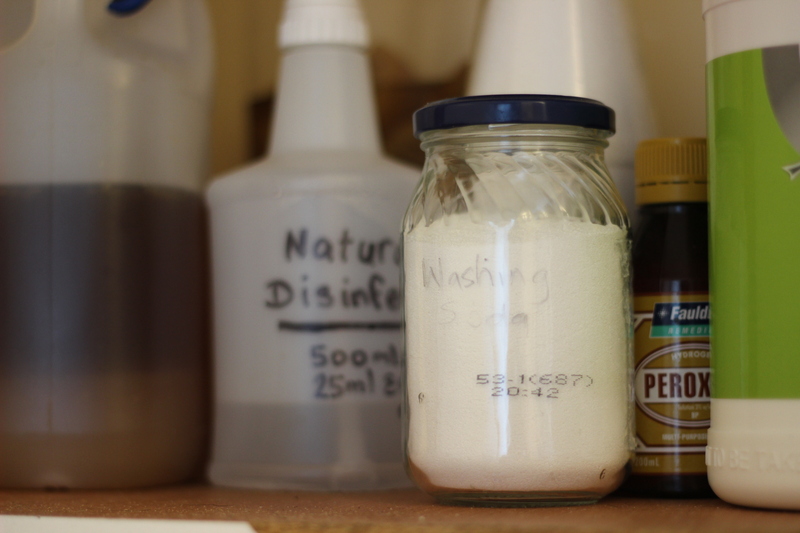 Once you have these ingredients in your house there will be no mess you can’t annihilate. 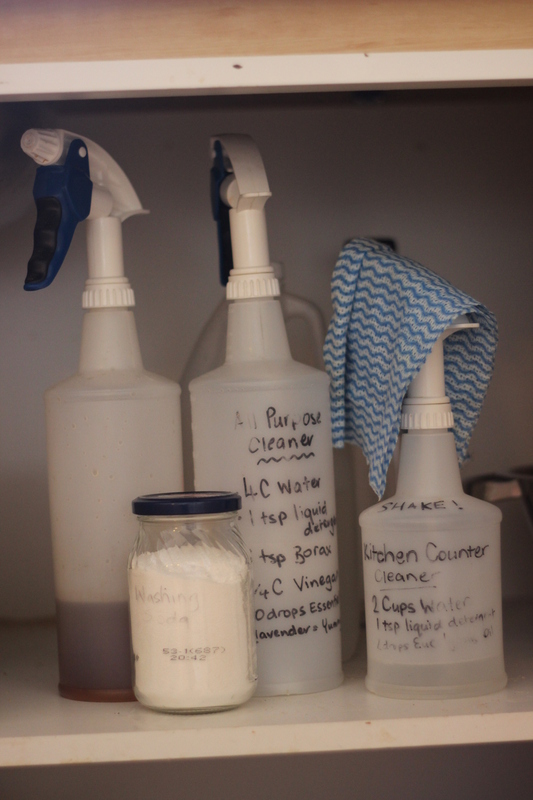 Your homemade products will be strong I assure you, but it is also worth noting that they may need a little extra elbow grease. The reason is that they aren’t full of toxic chemicals – a compromise I can handle! I think of it as a few extra muscles I’m toning. Lavendar Oil – smells so pretty! Other essential oils – Tea Tree, Lemon, any that take your fancy!!! Even though these are much more natural than your standard products they can still be harmful so always wear gloves and keep away from kids. Washing Soda is not good for aluminium and will remove wax polish! Essential oils can be potent and some are dangerous to pregnant women, children or pets – ALWAYS CHECK THE BOTTLE. 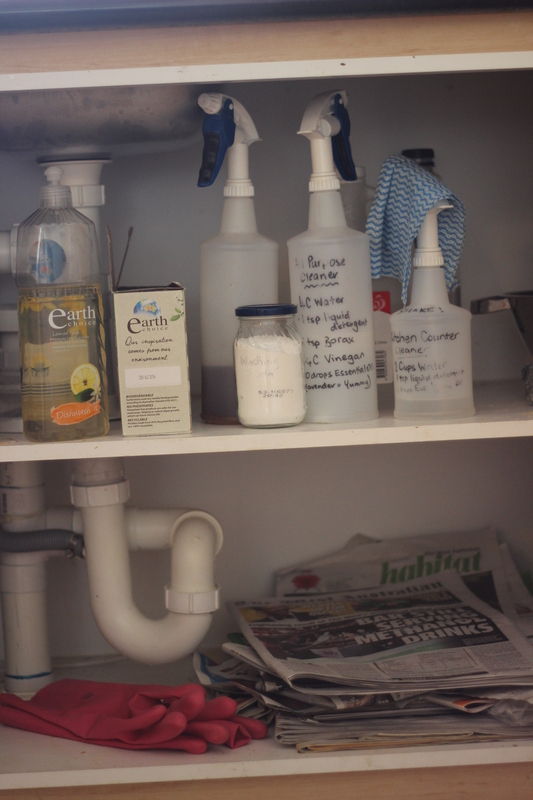 Newspapers – Best stuff for plastic free bins and cleaning glass! Spray Bottles – If you have cleaning products in spray bottles, keep those spray bottles and refill with your own solutions. However if you don’t have any go and buy them from a hardware (Bunnings has them) or homewares store. Jar Shaker – In my “Olive’s Clean Everything Solution” (see under Standards section) I use a shaker. Now if you want you can go buy one or you can just get a jar with a tin lid and punch some holes into the top with a knife or hammer and nail. Put the Bicarb into the jar, lid on and shake away! Either way, keep your widowed socks and torn pantyhose. These are perfect tap cleaners and door knob buffers!!! 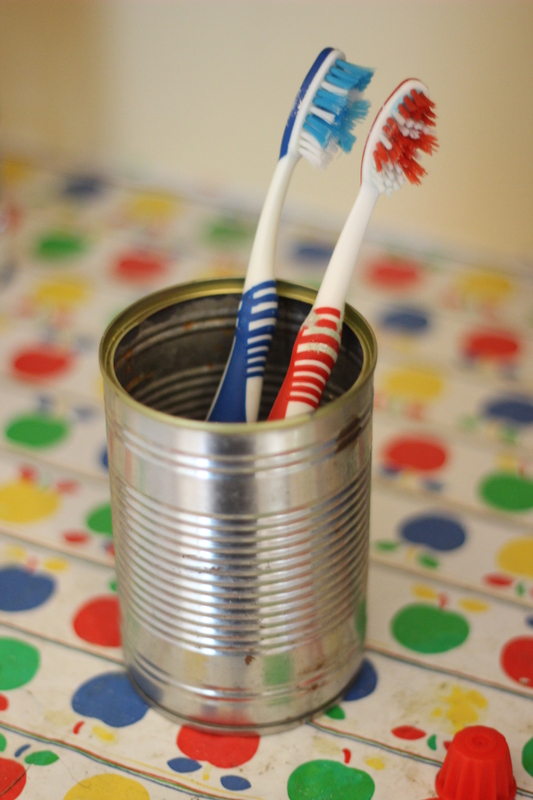 Toothbrushes – Keep all your old ones. They are great for scrubbing hard to reach places or delicate ornaments. Old T-shirts and Sheets – Keep any fabric that can’t be given to an opshop for use as an old rag. When we had floorboards I used to elastic band them to my broom to make a swiffer mop for dust… worked a charm. Old Towels – Cut these into small squares, overlock the edges and you, my friend, have the hardiest cleaning cloth in the business! 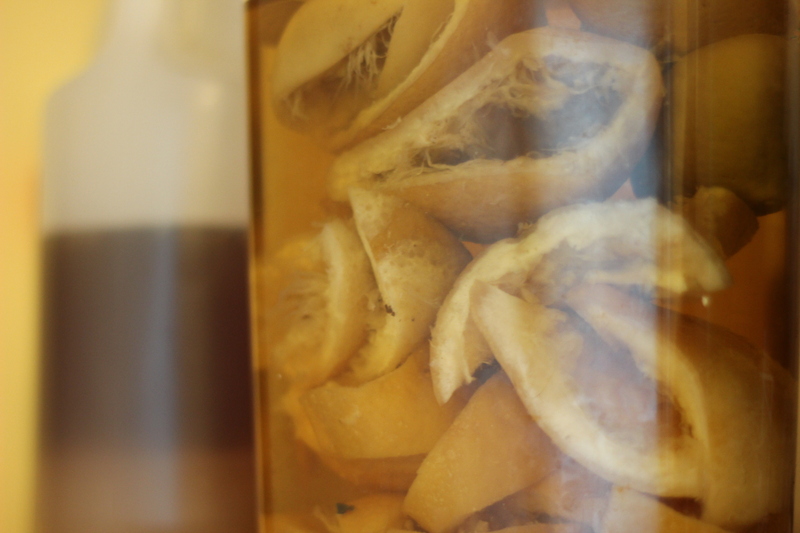 Citrus Vinegar, I LOVE YOU! Mix into a spray bottle. Shake before each use. Sprinkle Bicarb soda onto surface. Spray with vinegar until you hear fizz. Wipe off with rag/sponge. VOILA. Two thirds hot water, one third vinegar. That’s it. 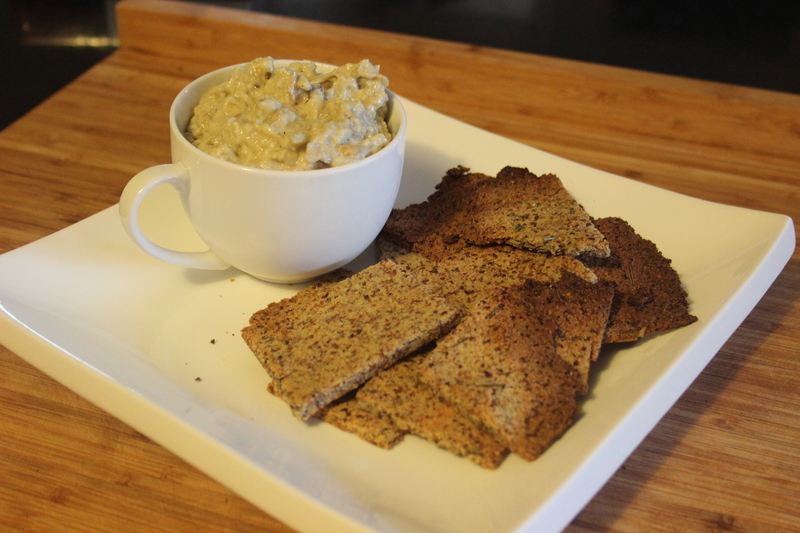 I (of course) like to use citrus vinegar for this but white is perfectly fine. If you have darker floors you can use apple cider. Apple Cider does taint floors slightly though so if you have white tiles don’t try it. Similar to clothes washing, I have not yet invented a washing powder or liquid that works to my liking. 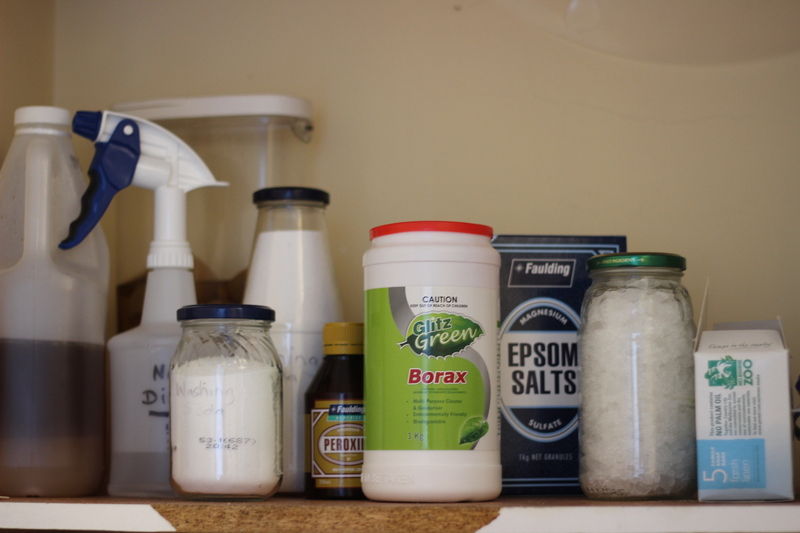 I have tried 1 Cup borax + 1 Cup baking soda + ½ Cup salt but sadly no luck – although others I have spoken to love this mix. I also find the detergents from stores very useful as I often add a teaspoon or two to my mixes and they go an awfully long way! So (same as laundry) I use Eco Store, Ecover or Earth’s Choice – links and information about these companies in the Laundry section of this post. Washing soda is the ultimate grease killer which makes it perfect for washing pots and pans. Use a damp cloth or sponge to wipe the inside. The mess will wipe off really easily! 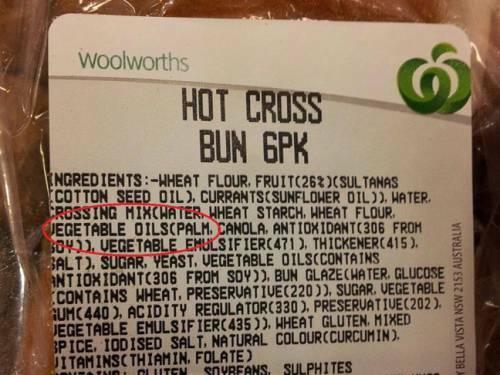 Mix all the ingredients together to form a paste. Paint the paste onto the oven stains (I use a pastry brush but you could use an old paint brush!). 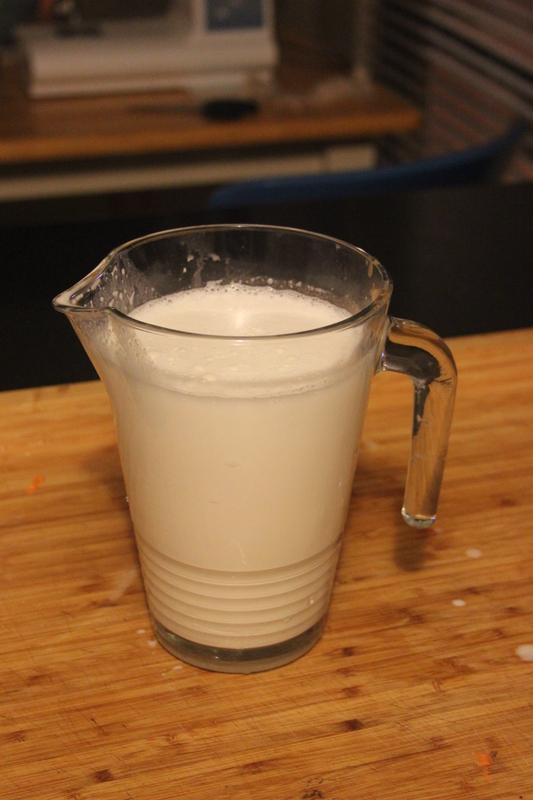 Let it sit for at least 4 hours (aim for 6) and it will foam up. Then wash with a cloth and warm water. AMAZING! I haven’t met a mess it hasn’t fixed yet. 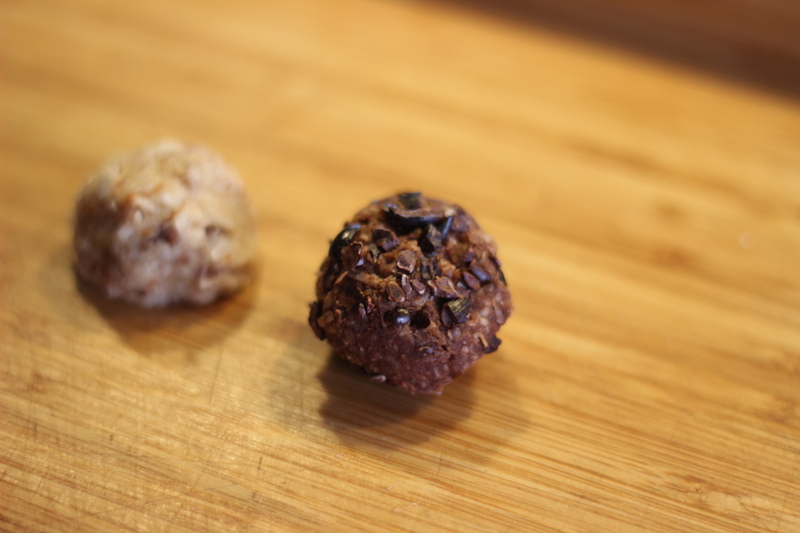 Buff… buff like David Hasselhoff damnammit! I have 3 brands that I really trust… unfortunately it can be difficult to get my faves at the major supermarkets but I think they are starting to stock them nowadays. Here they are in order of fave. NOTE: Keep an eye out for places that offer a refill service with these products! 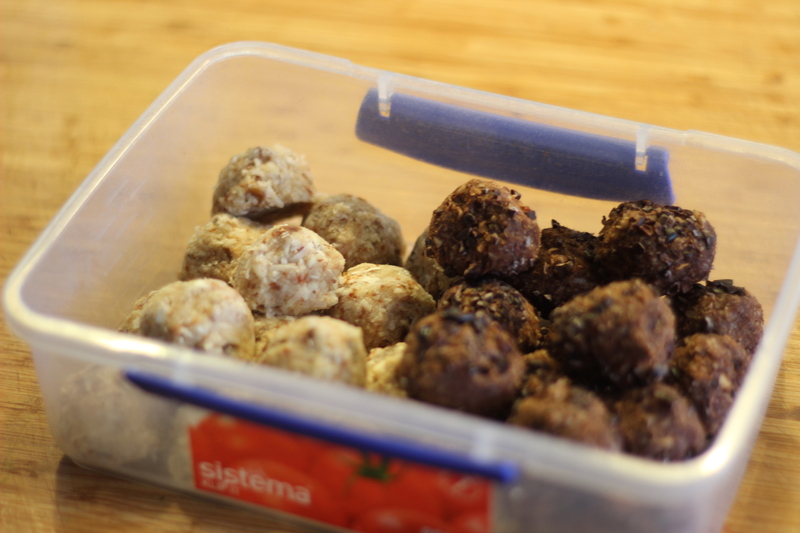 I keep my containers (or you can take your own) and refill them straight from a bulk container at either PAWS (Northbridge) or Manna Wholefoods (Fremantle). Brighter whites – Add 1 Cup of lemon juice to your regular wash OR soak clothes in hot water and 1 cup of lemon juice overnight then wash as normal. Dry them in the sun for added bright!!! Getting grease out of clothes – Absorb as much grease from fabric my dabbing (not rubbing) with a rag. Mix 4 Tablespoons of washing soda with ½ Cup of warm water in a bowl to form a paste then rub the paste into grease stains (wear gloves!). Wash as normal (add ½ cup to washing machine for particularly hardy stains). Check your item of material to see that grease is gone before drying (otherwise the heat may set it) and if some remains… repeat the process. Use Less Detergent – I add ½ cup of Soda Crystals to my washes which not only softens the water but also help to break down really nasty stains. It also means I can reduce the amount of detergent to the manufacturer’s instructions for soft water. Wow! I am sure I have forgotten one of my solutions. If I have or you need any advice then please let me know in the comments. I’d also love to if you have any green cleaning solutions to share. So I decided I would get going on my sustainable decorations at the very start…. my front door. 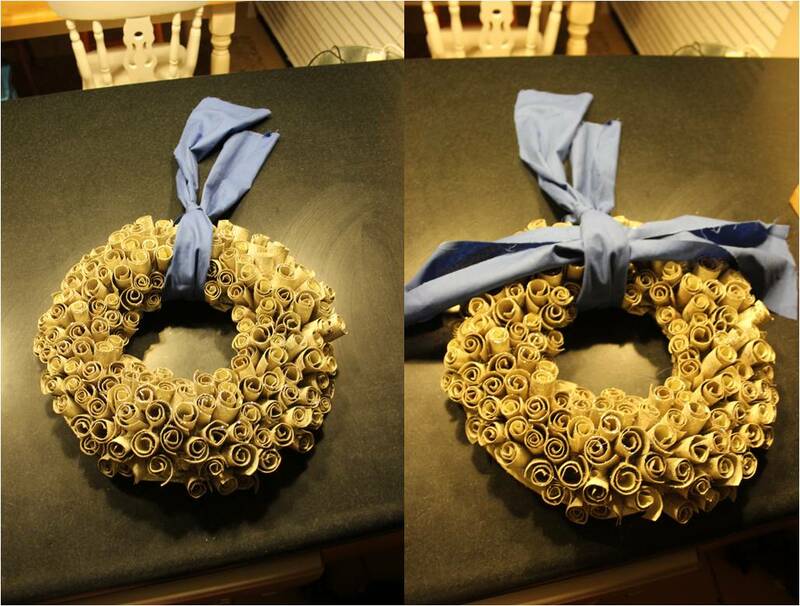 There aint nothing better than a wreath. 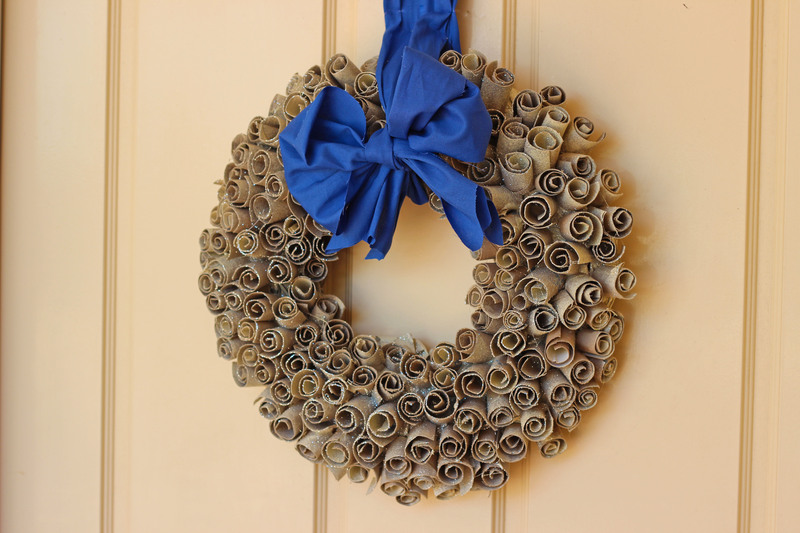 I had seen plenty of amazing wreaths on Pinterest (follow me here) but was particularly inspired by this one which I saw at Proverbs 31 craft blog. It also suited me as I save all my toilet rolls (they are very handy for all sorts of crafts and around-the-house uses). So I set off on my merry way and I have to say I am really, really proud of the results! Considering I made this whole thing from what would be considered waste products (old cardboard box, newspaper, toilet rolls, fabric off-cuts) it really proves that one woman’s junk is anothers’ treasure. 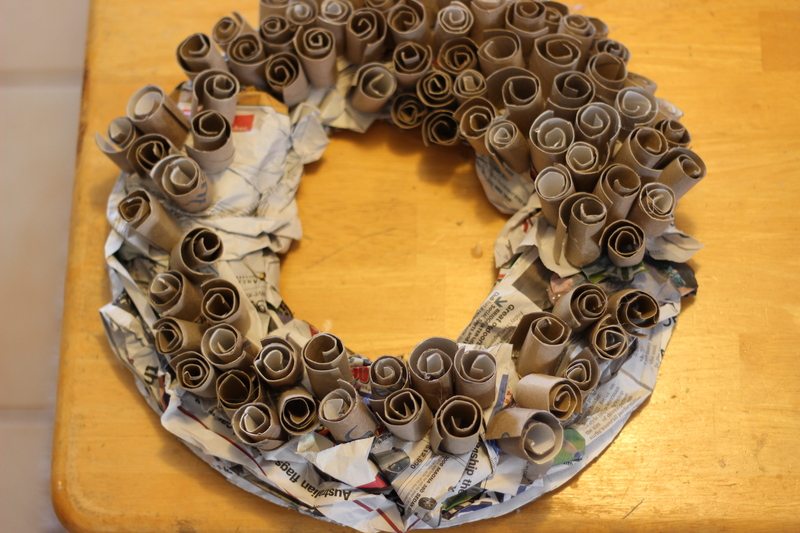 Toilet rolls (depending on how big your wreath is you will need quite a few). 1. First make your wreath template. 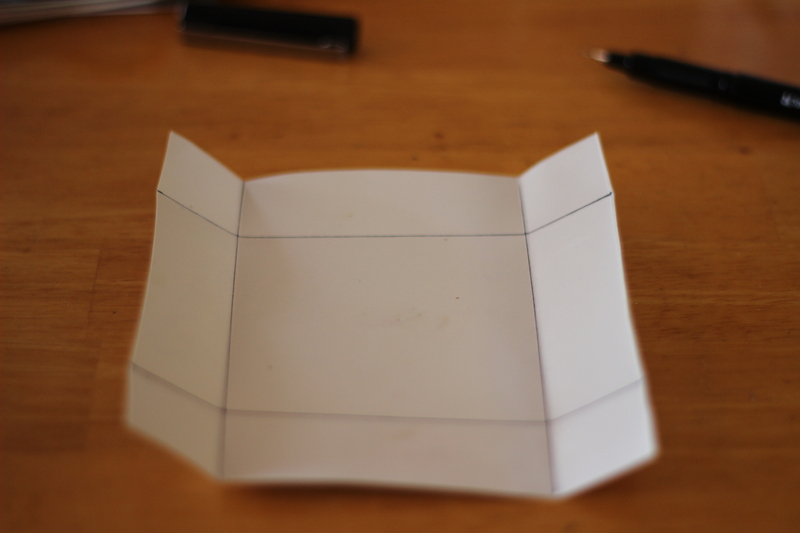 I have seen plenty of blogs that suggest buying a Styrofoam template… there really is no need to use that nasty material. 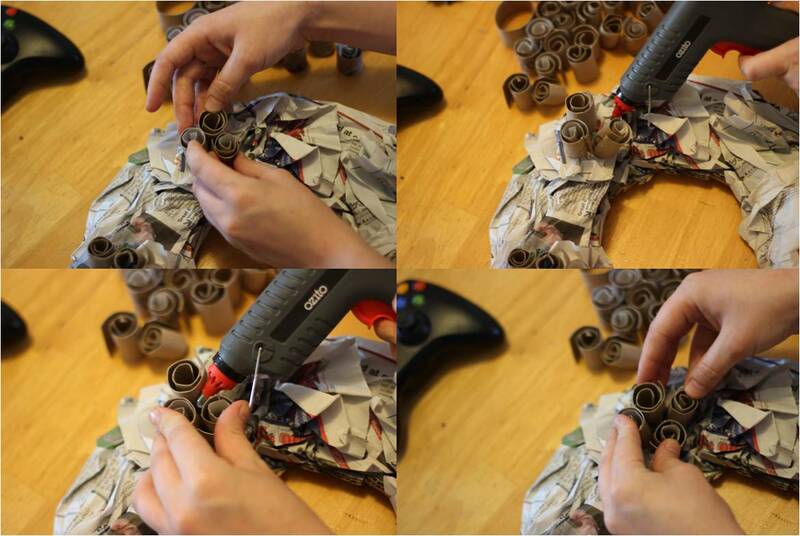 All you need is some cardboard and newspaper. I traced out a large salad bowl shape (40cms diameter) and then traced around a smaller bowl before cutting it out to create the donut shape (this is where a Stanley Knife would come in handy). 2. 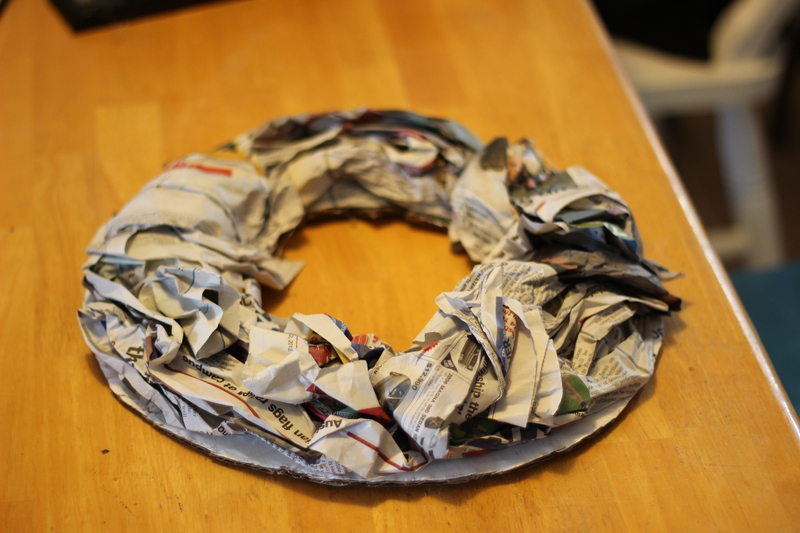 Then to give your wreath some central body I scrunched up newspaper and glued it onto the donut. This is going to covered in toilet roll rosettes so don’t worry if it looks shabby! 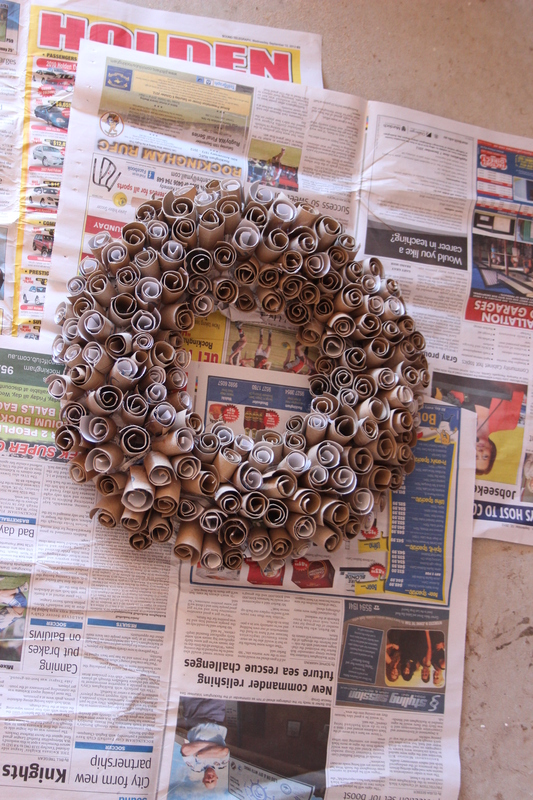 Voila.. you have your recycled wreath template. 3. 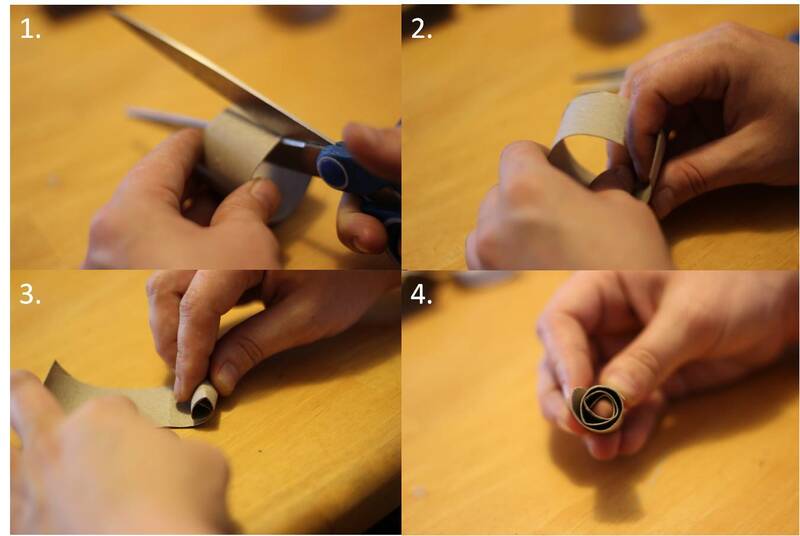 Then you need to cut your toilet roll rings. 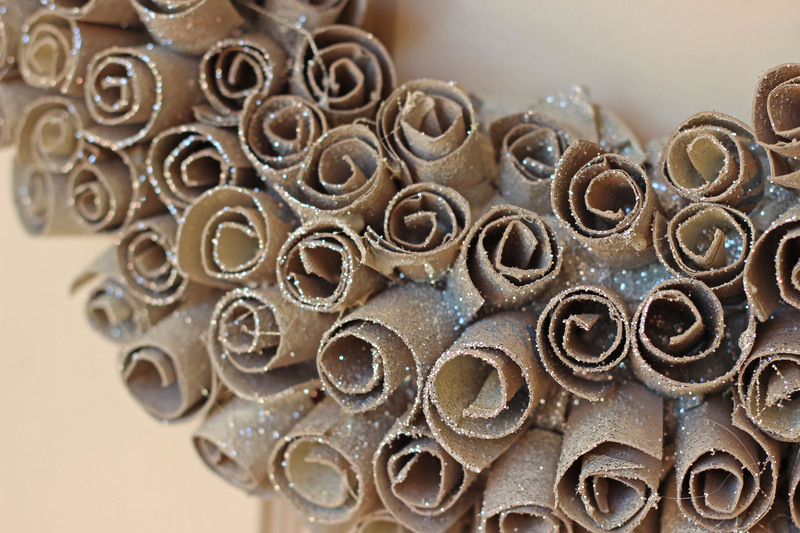 I wanted my wreath to be a really pretty textural wreath with all different levels and lengths of rosettes. Therefore I cut my toilet rolls into thirds, fourths and fifths. 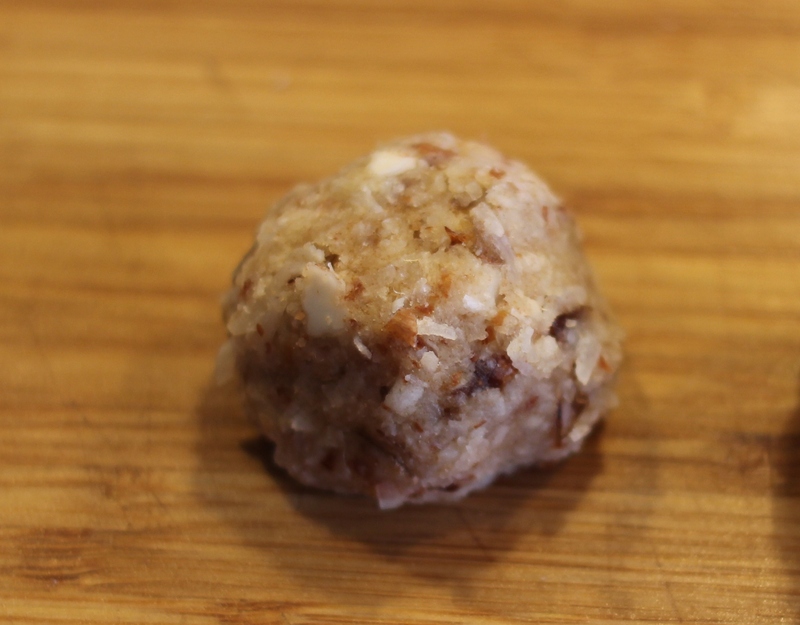 You don’t have to rule these you can just cut away – it doesn’t need to be perfect. Note: If you don’t have many toilet rolls you may want to cut the roll into fifths so that you get more bang for your buck out of each roll. 4. Once you have your rings you will make them into rosettes. Cut the ring to open them up and then roll. Again I varied rolling them very tightly and loosely. 5. Now it’s time to start gluing the rosettes to your wreath. Blob hot glue onto the newspaper and press the rosettes onto them. 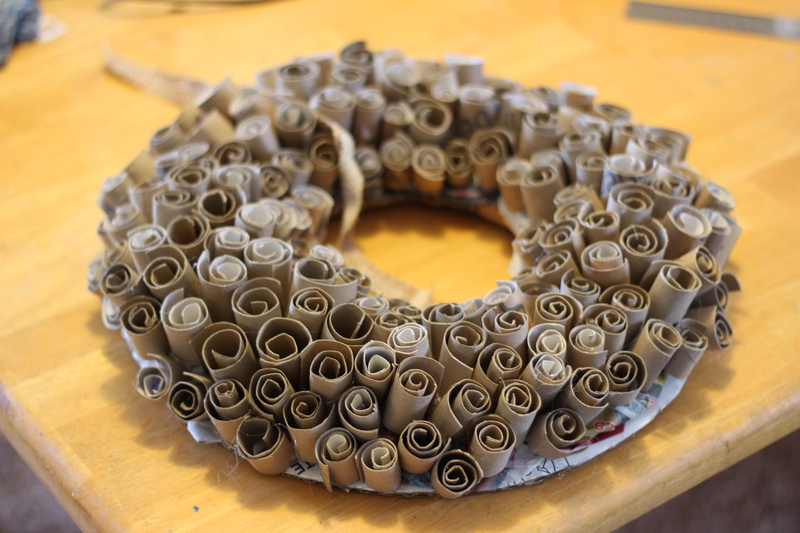 I started by using the taller rosettes (the ones I had cut from thirds) and gluing them around the centre of the ring. I tried to angle them so the centre of the rosettes weren’t all just facing up and were looking in different directions (for added visual interest). 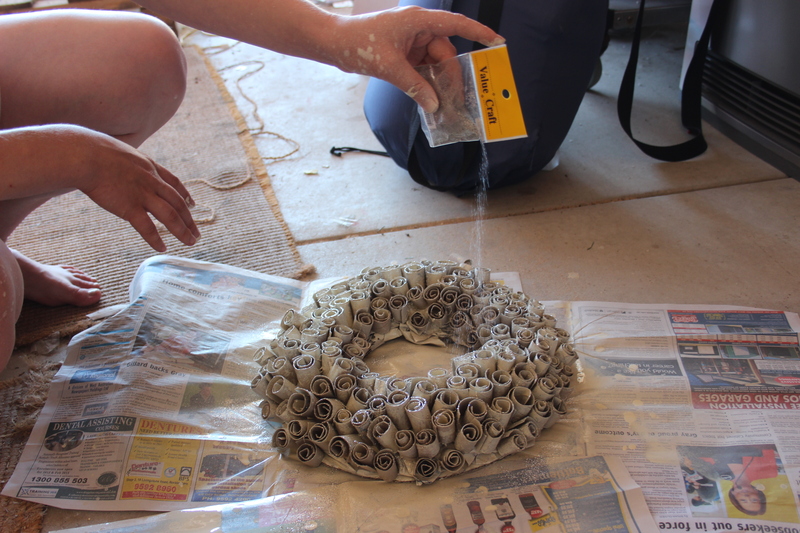 At times you will need to dob bits of glue in between them so the rosettes use each other for added structure. Once I had the taller central ring of rosettes I started gluing in the shorter ones around the edges until the wreath was completely covered. 6. I actually really like the toilet rolls left in their natural state… I think they looked deliciously rustic… but I also really felt the need for some sparkle. So I used some old spray paint I had left over from another project and gave the wreath a really fine spray until it was a creamy brown colour. One positive is that this will seal the wreath and protect it for next year! Aerosols are unfortunately not great for the environment but you can get your hands on ‘friendlier’ alternatives for projects that really do require them. I favour Krylon’s H20 Latex Spray Paint (see the treehugger write up here) – it is an environmentally better option although sadly still not perfect. Here are some places you can get them in Australia. 7. While the paint was still wet I dusted some left over glitter onto the wet wreath. Fairy dust makes all the difference. Let the wreath dry. 8. 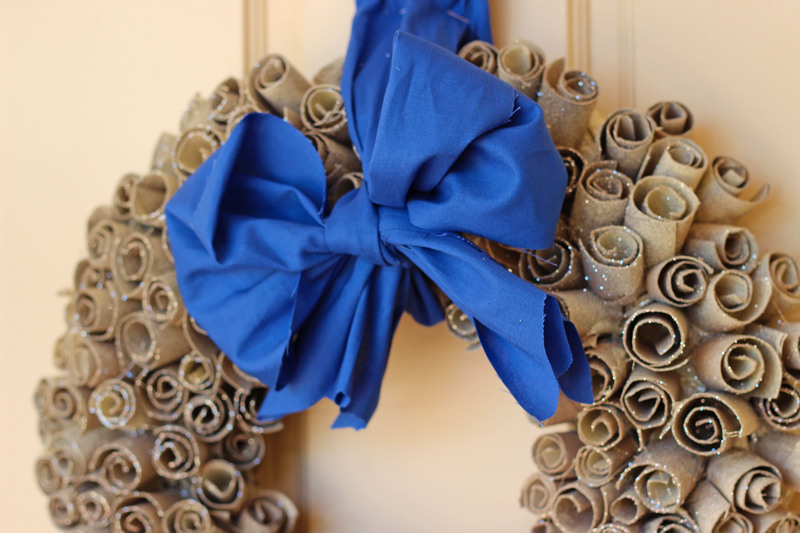 Once your wreath has dried it is time to tie the bow onto it. I used fabric off-cuts though you could also use a fat ribbon if you do not have any. The pieces I used were very thick (approx 15cms) and therefore I needed them to be minimum 80cms long. Tie the first piece around the top of your wreath – tie the knot tight as this will be what your wreath hangs from so you want it to be secure. Then thread the other piece between it and the toilet rolls. Tie a bow and fluff it up appropriately.Then cut the ribbon tails to the perfect size. The bow may take a couple of goes to get right. 8. 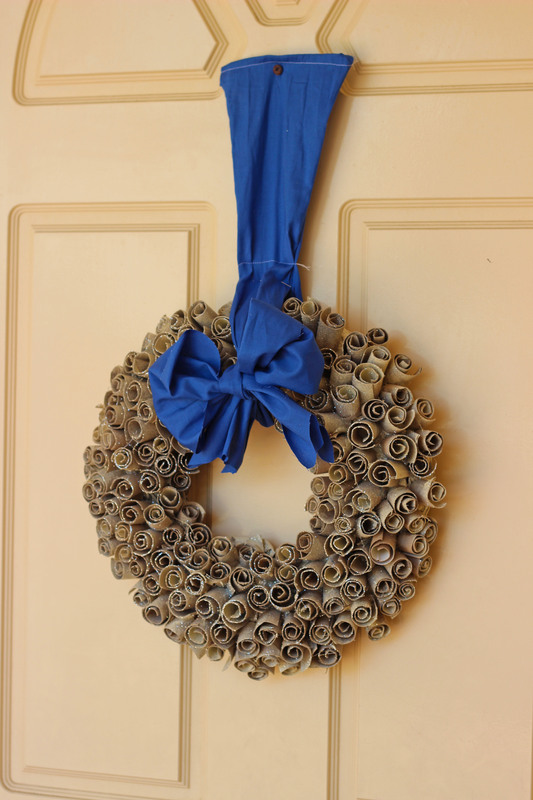 Merrily hang on your door while humming “Deck the halls”… because tis the season to be jolly! Be sure to take a step back and admire your wonderful crafty work! 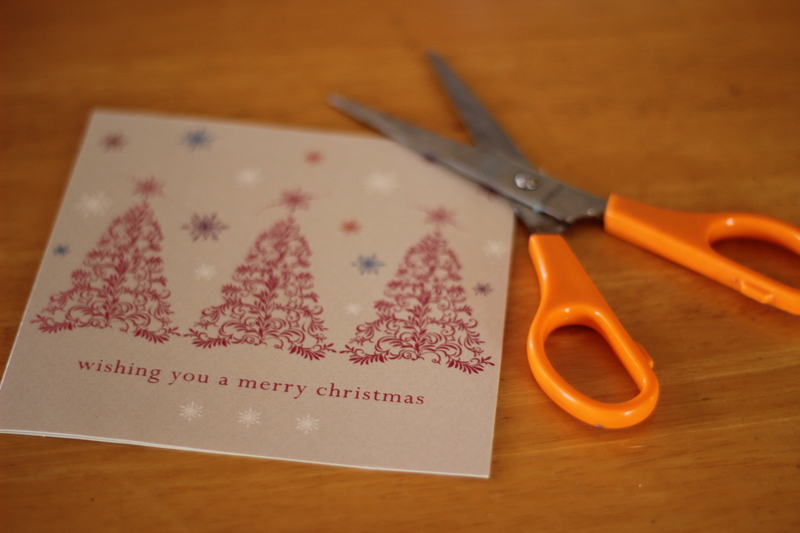 Last Christmas I was a bit of an Eco-Grinch. I got really grumpy at the fact that a time that is meant to be about family and love and all that good stuff had morphed into a cash cow… an exercise in capitalism. But I still didn’t want to let Christmas go. 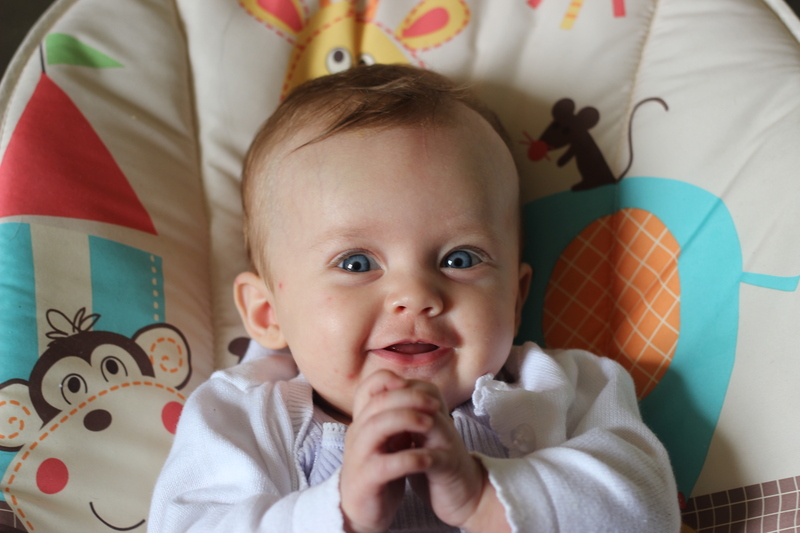 I grew up in England with snowmen and amazing Christmas trees and dad dressing up like Santa – and being pregnant I want my little daughter to grow up with memories as lovely as mine. 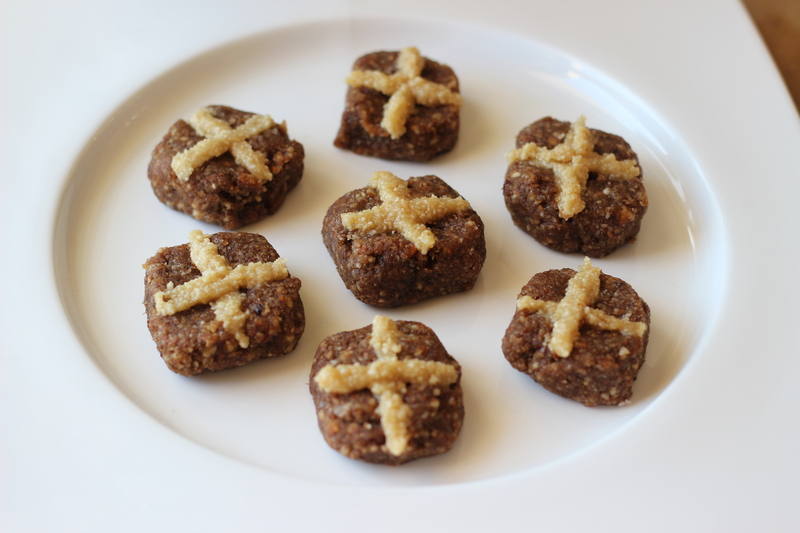 So I am on a mission to keep my festivities completely eco (and blog about it of course!). In January – going off the theme that reuse is better than recycle – I asked all the people in my office to give me their unwanted Christmas cards. I took a whole lot down to the local school to use for crafts but was still left with a massive pile of them. I stored them with my Christmas decorations and hoped to think of something to do with them by Christmas time. And I did. 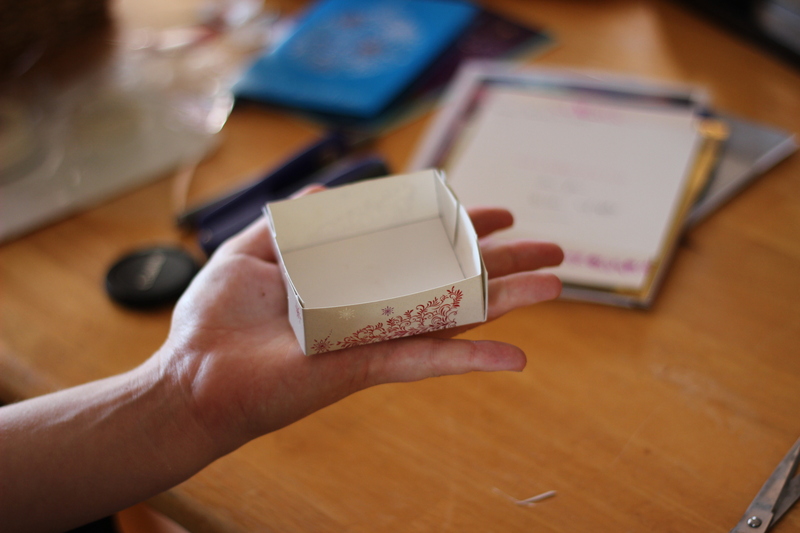 Here is an ultra simple gift box that you can make from an old greetings card. 1. 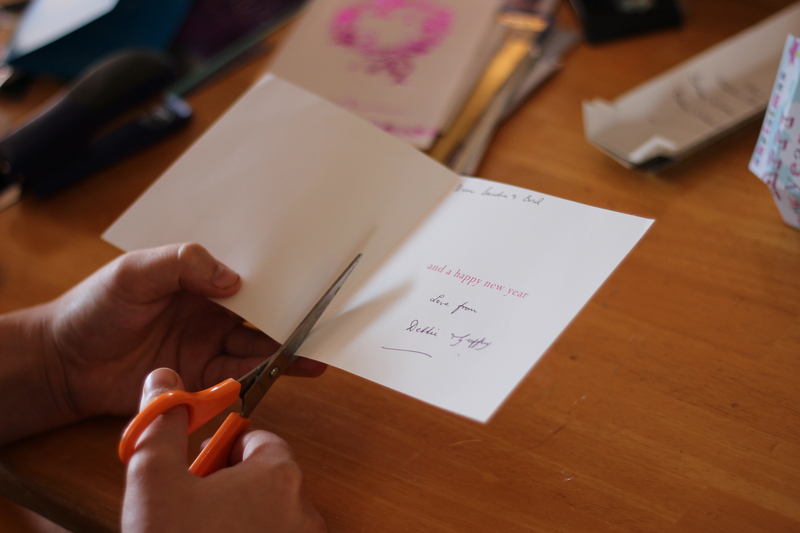 Cut along the seam to separate the front of the card from the back. 2. Decide how thick/deep you want your box to be (look at the gift/item you are putting inside it to make sure it will fit!). Once decided rule a margin around the sides. 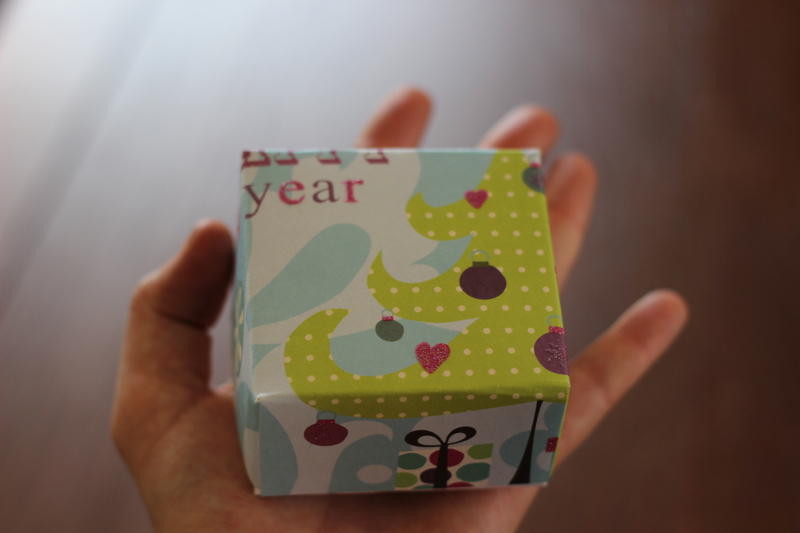 I varied between 2 and 3cms (0.5 – 1″) for my boxes. 3. Fold along each line. I did this by placing my ruler along the line and then folding the paper over it… was a lot quicker and more precise. 4. Cut along the lines on 2 opposite ends only. 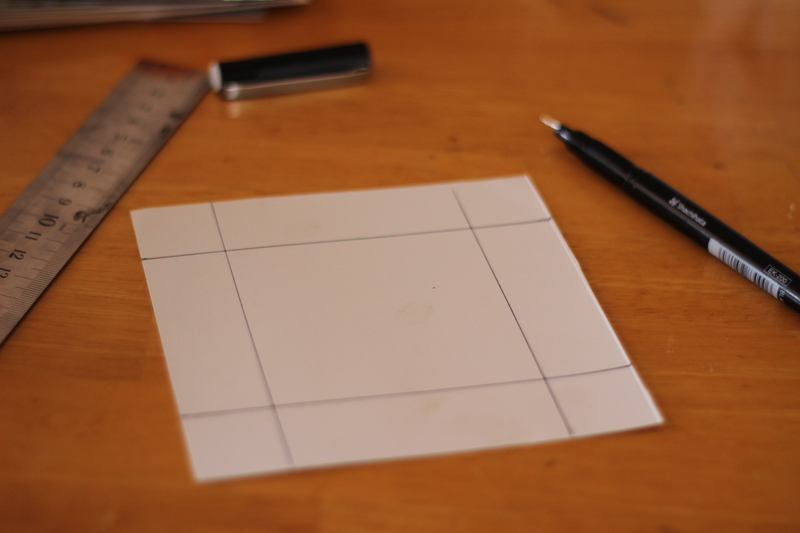 What I mean by that is you don’t want to cut the corner squares out… you just want to create a flap. See next photo if you are unsure of what I mean. 5. 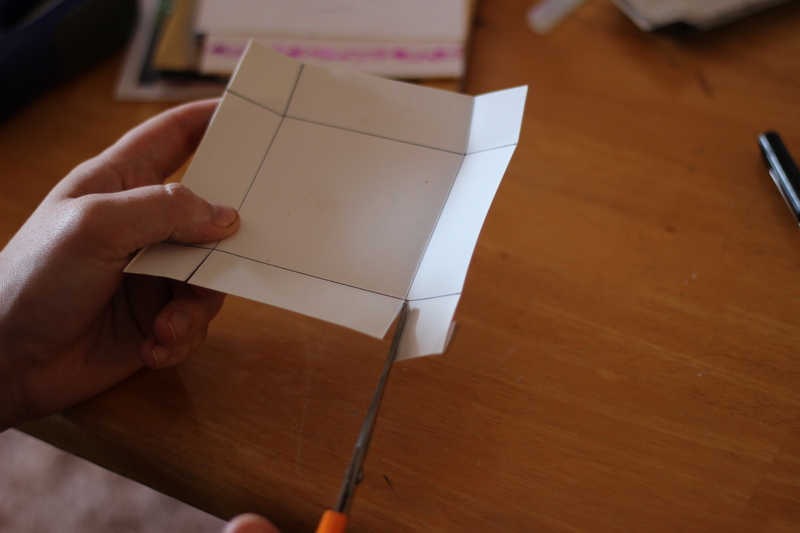 Fold the flaps in and apply dobs of glue. Then pincer together to make your box shape. 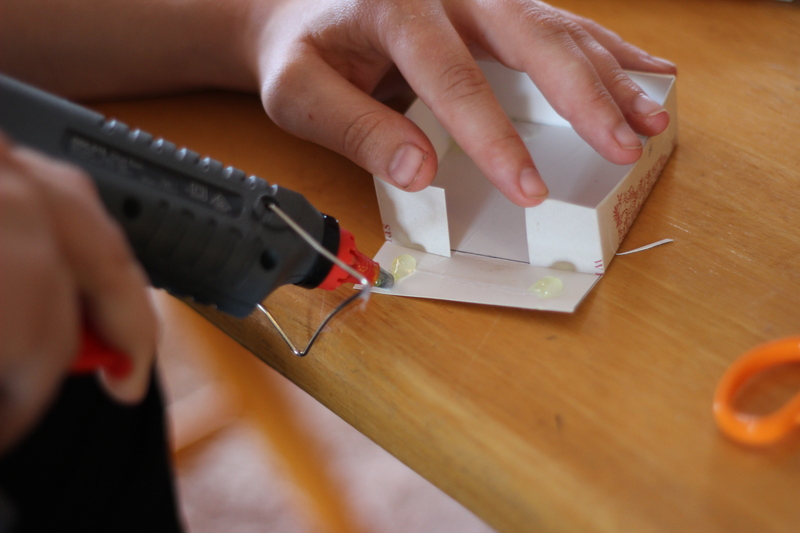 If you are just using a glue stick you may want to hold the flaps together with pegs or paperclips to ensure the box really sets and is sturdy. Hot glue gun is definitely preferable though. 6. And there you have one half of your box! ( Use the pretty front part of the card is the top of the box). Repeat the process to make the other half of your box. 7. When I was drawing the margins in for the bottom half of the boxes I made the margins a couple of mm’s bigger than the top boxes so that it fit comfortably without needing to bend. E.g. my margin for the top was 3cms on each side, my margin for the bottom was 3.2cms on each side. You could also thread some ribbon through them and hang them from your tree filled with goodies. Easter will be another hurdle in anti-consumerism! I have brill memories of Easter Egg hunts but how will I give these to my daughter without all that nasty foil and needless wrapping? 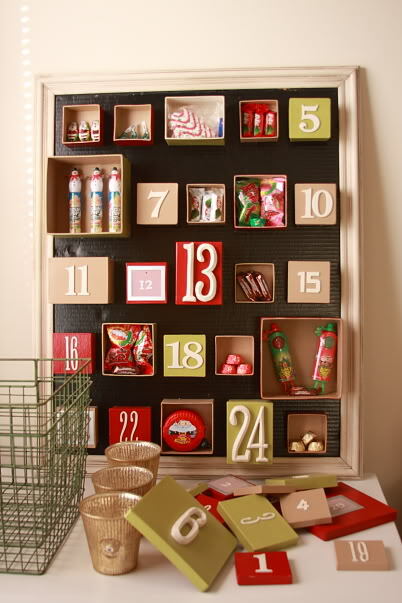 You could bulk buy chocolates and place them in little boxes and hide them around the garden! WIN. 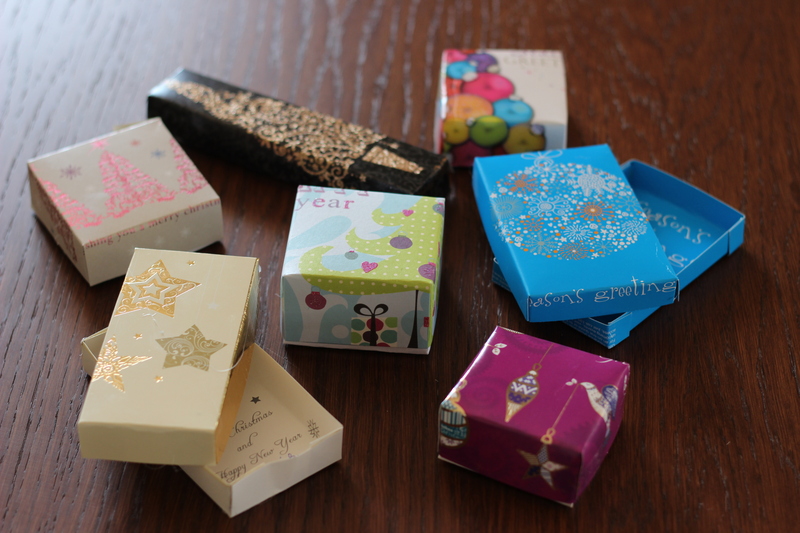 These could also be cute little DIY boxes to keeps your paperclips etc in!